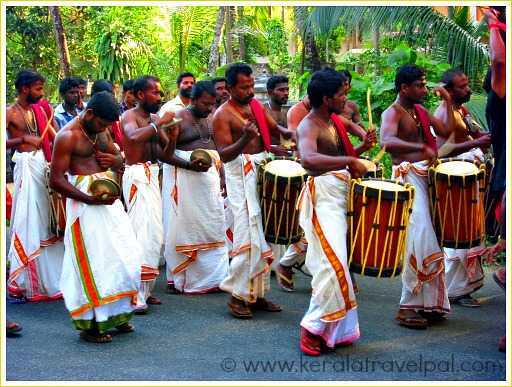 Temple festivals in Kerala take the place of pride among all celebrations. Witness one, and you will see why God's own country has God's own festivals. True, they come straight out of our hearts. Almost every village in Kerala have a temple and most of them celebrate a festival once a year. Some even more. It is not just Temples, some Churches and Mosques also hold grand festivals. Small and large put together, their count could easily reach several hundreds. Surprising, aren’t they? Have you seen caparisoned elephants, lined up in display of grandeur? Large festivals could have fifty elephants, sometimes even more. These elephant line ups are an unparalleled experience unique to this part of the world. Elephant displays are only a part of temple festivals, perhaps the most visible part. Where would these festivals be without the hectic drum beats, the eccentric tones of the energizing music, the wild frenzy and the sky breaking fireworks? Fervour is in the air, on the faces - almost everywhere. Most tourists have no clue about Temple festivals in Kerala. So let us get to the basics. Temple festivals come in different names – Vela, Pooram and Bharani. Muslim festivals are usually called Nercha and the Christian versions, Perunnal. However, Hindu festivals outnumber and outshine all the rest. Names may vary and there can also be differences in rituals. However the fun part is quite the same, be it the processions, the elephant displays or the spectacular fireworks. Again, there are exceptions such as Attukal Ponkala, a gathering of women who bring their pots and cook as offering. 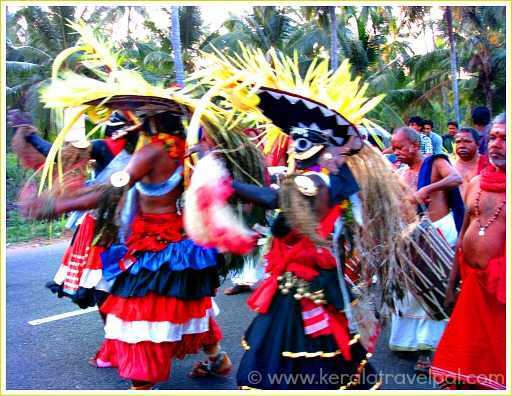 Temple festivals in Kerala start from December and run through the dry season, till May. November to Mid January is the Sabarimala Pilgrimage season. With 45 – 50 million pilgrims, the annual pilgrimage to Sabarimala in Kerala is the largest of its kind in the world. Temples celebrate Ayyappan Vilakku, in association with this pilgrimage. They are small scale events held within one or two villages. One of the standout festivals during November - December is Guruvayoor Ekadasi, held at Guruvayoor temple in Central Kerala. As with Pooram festivals, from January onwards the heat is on. Temple Festivals can range from a day to several days. As excitement and performances build up, the Pooram reaches its climax on the final day. Having caparisoned elephants is a matter of pride. So temples who can afford them will have at least a couple. People are emotionally attached to these festivals, that they want Poorams in full blitz. Downsizing is not the way to go. Pooram is the fruit of long term preparation. Each temple has a Pooram committee who plan, prepare and oversee the festival. Processions are part of Temple festivals­. Theyyams and Thiras (the photo below) accompanied by fans and drummers parade through the villages before finally assembling at the Temple grounds. The grounds become a meeting point of hundreds, thousands or even millions of people. Some festivals have competing sides, such as competing villages. Their healthy rivalry gets manifested in nothing more than the much anticipated fireworks. 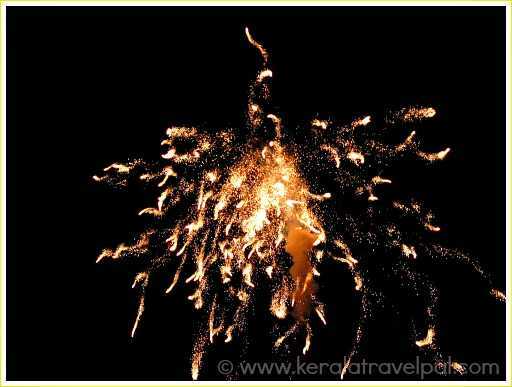 Fireworks are a matter of pride and the first component to judge how well the Pooram fared. 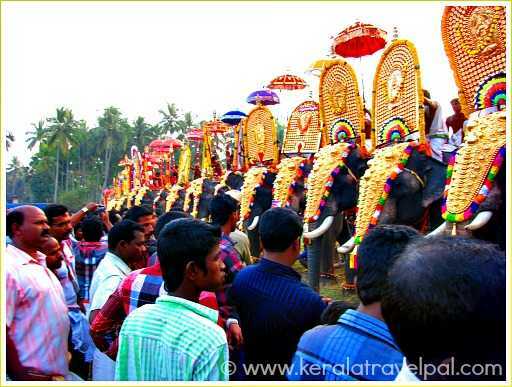 The most important Pooram is held at Thrissur annually during April – May. Intense and stunning, Thrissur Pooram is an out of the world display of great traditional orchestras, elephant displays, the parasol exchange extravaganza (Kudamattam) and a set of top class fireworks. You have to see it to believe it. Some of the top level festivals are Nenmara Vallangi Vela, Uthrali Pooram Vadakancherry, Arattupuzha Pooram, Mannarkad Pooram, Pattampi Nercha, Chinakathoor Pooram.......Well the list is quite long. If you are in Kerala during the festival season, try to visit one Pooram. Of course you will have to put up with the crowds, the dust and the noise. As a reward you will be experiencing something that is truly unique and marvelous.